In September 2016, Susan Schneider Williams crafted a moving testament in the journal Neurology to raise awareness of Lewy body dementia (LBD), the debilitating disease that plagued her husband, actor Robin Williams. Describing the illness as an "intense, confusing, and relatively swift persecution," she introduced LBD to millions of Americans while calling on those of us in the medical community to better understand and eventually defeat the disease. Nearly 1.5 million Americans struggle with LBD, with many, like the late actor Williams, not realizing it. Particularly challenging are LBD's symptoms, which present similarly to Parkinson's disease and the early stages of Alzheimer's disease, making diagnosis difficult in a clinical setting. Equally troubling is the fact that patients who experience such changes may wait years before alerting their physicians, delaying treatment that might lessen the most disabling symptoms. Despite the fact that no cure currently exists, available treatments for all three conditions can be helpful if a patient is properly diagnosed. That's why my colleagues and I recently conducted a clinical trial to determine whether changes in patients' cognition and mobility can reveal which of the three conditions is emerging. Our findings in "Paired Studies Comparing Clinical Profiles of Lewy Body Dementia With Alzheimer's and Parkinson's Diseases," published in the Journal of Alzheimer's Disease, were encouraging. While our initial trial was small, we believe specific indicators differentiate LBD, Parkinson's, and Alzheimer's patients, allowing earlier—and more effective—treatment. While amyloid beta proteins are the hallmarks of Alzheimer's disease, LBD is associated with the excessive accumulation of alpha-synuclein proteins. The alpha-synuclein proteins aggregate within neurons to form clusters, the Lewy bodies. Accumulating slowly, they are toxic to neurons and ultimately cause their signals to fail. The bundles of protein were first identified more than a century ago by German scientist Friedrich H. Lewy, who worked in the laboratory of Aloysius ("Alois") Alzheimer, MD, and have been linked to dementia ever since. Research has shown Lewy bodies are present in Parkinson's disease and in Parkinson's disease dementia. They also accumulate in the neurons of some patients with Alzheimer's disease. In patients diagnosed with the most common form of Parkinson's disease, Lewy bodies affect neurons controlling movements and, in most cases, dementia does not occur. When Lewy bodies progress to damage other brain regions, cognitive impairment and dementia ensue. In patients with Alzheimer's, the effect of Lewy bodies remains unclear. After death, pathologists can examine a patient's brain for amyloid beta proteins indicative of Alzheimer's or use postmortem immunohistochemical staining to locate where alpha-synuclein proteins accumulated, differentiating LBD from Parkinson's disease. However, in life a patient's diagnosis is heavily dependent on the symptoms he or she presents, and when those symptoms first emerged. Across all three conditions (Alzheimer's disease, LBD, and Parkinson's disease), symptoms can be deceptively similar. In LBD, the damage begins in the brainstem and deep grey matter, then extends to the limbic, parietal-occipital, posterior temporal-occipital, and frontal cortical regions.2 As a result, patients will generally first see declines in retrieval memory, executive processing, and visual processing. While tremors are a familiar indicator of Parkinson's disease, research from 2014 has revealed associated nonmotor symptoms such as impaired cognition, excessive daytime sleepiness, and depression, which are also symptoms in patients with LBD.4 In such cases, the tremors ultimately contribute to the Parkinson's diagnosis, but the symptom overlap with LBD is clear. Unless a patient's physicians are well informed about the potentially subtle differences between those conditions—and perhaps most critically, have concrete data regarding when symptoms first appeared—diagnosis is incredibly challenging. For patients with undiagnosed LBD, with no hallmark movement disorders or other conditions to guide a physician toward a better understood condition, the cognitive issues can be especially terrifying beyond the sleep apnea, changes in gait, and other symptoms that appear seemingly out of nowhere. Robin Williams was diagnosed with Parkinson's based on such symptoms as a hand tremor, but his LBD diagnosis came months after his death. If patients can learn early on that LBD is causing such changes, they can take some semblance of control over their condition, better manage symptoms, and enter into studies that are evaluating treatments. Supported by a grant from The Harry T. Mangurian, Jr. Foundation, my colleagues and I at The Ohio State University Wexner Medical Center's Center for Cognitive and Memory Disorders conducted two paired-comparison studies to determine the feasibility of an LBD early diagnostic method.5 We have had success applying diagnostics to Alzheimer's and other forms of dementia, such as using the Self-Administered Gerocognitive Examination (SAGE), and we're hopeful that continued research can bring similar results to patients with LBD. Our goal was to develop an approach that can more clearly and easily differentiate patients with LBD in relation to patients with standard clinical diagnoses of Parkinson's and Alzheimer's, using tests that are universally available to physicians. Numerous researchers have outlined traits with the potential to be diagnostic, and based upon those findings we investigated similarities and differences in motor impairment, cognition, autonomic traits, behavior profiles, and sleep. We recruited our subjects from the Memory Disorder and Movement Disorder Clinics at Ohio State University Wexner Medical Center. Recognizing the numerous variations of LBD and the fluidity of symptoms, we chose 21 patients who met standard clinical criteria for two common forms of LBD—dementia with Lewy bodies or Parkinson's disease dementia. Symptoms for those conditions definitively overlap and both can benefit from the same early therapeutic treatments. We paired those patients, as a single cohort, to 21 patients with Alzheimer's disease to compare cognitive symptoms, and separately to 21 patients with Parkinson's disease to compare motor control symptoms. Using careful demographic matching and diagnostic tools not previously applied to such direct comparisons, we were able to clarify differences between otherwise similar motor and cognitive impairments. 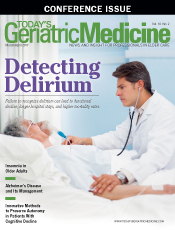 To evaluate cognition, each patient with LBD was matched by age, gender, education, race, and Mini-Mental State Examination6 scores to a patient with Alzheimer's. To evaluate mobility, each patient with LBD was separately matched by age, gender, education, race, and Unified Parkinson's Disease Rating Scale III7 to a patient with Parkinson's disease. • have more daytime sleepiness, cognitive/behavioral fluctuations, and obstructive sleep apnea than either Alzheimer's or Parkinson's subjects. Additionally, LBD patients were less likely to experience the resting tremors indicative of Parkinson's disease and more than six times more likely to experience visual hallucinations than either of the other cohorts. Our research builds on a number of previous studies refining the diagnostic tools to better identify LBD and other forms of dementia. Our sample size was limited to 63 patients overall, only 21 of whom have diagnosed LBD, limiting our data set. In future research, DaTscan, amyloid PET imaging, cerebrospinal fluid analysis, polysomnography, and pathology would be valuable additions to strengthen confidence in the clinical diagnoses. If such validation holds, then the more cost-effective, widely available tests described in our study may be more universally used. Susan Schneider Williams did a great service to all patients with LBD and their families by so effectively raising awareness of the condition. It is now imperative that our clinical efforts match her commitment. Organizations such as the Lewy Body Dementia Association and the American Brain Foundation, where Williams serves on the board of directors, have done well in efforts to connect patients with a community of support. As we as physicians and researchers work toward the ultimate goal of preventing and curing LBD, we should endeavor to thoroughly and accurately diagnose the disease and bring additional comfort to our patients. — Douglas Scharre, MD, is director of the Division of Cognitive Neurology, director of the Center for Cognitive and Memory Disorders, and director of the Memory Disorders Research Center at The Ohio State University Wexner Medical Center. Board certified in neurology, he specializes in cognitive disorders and dementias, including Alzheimer's disease. 1. McKeith IG. Consensus guidelines for the clinical and pathologic diagnosis of dementia with Lewy bodies (DLB): report of the Consortium on DLB International Workshop. J Alzheimers Dis. 2006;9(3 Suppl):417-423. 2. Nedelska Z, Ferman TJ, Boeve BF, et al. Pattern of brain atrophy rates in autopsy-confirmed dementia with Lewy bodies. Neurobiol Aging. 2015;36(1):452-461. 3. Mirra SS, Heyman A, McKeel D, et al. The Consortium to Establish a Registry for Alzheimer's Disease (CERAD). Part II. Standardization of the neuropathologic assessment of Alzheimer's disease. Neurology. 1991;41(4):479-486. 4. van der Heeden JF, Marinus J, Martinez-Martin P, van Hilten JJ. Importance of nondopaminergic features in evaluating disease severity of Parkinson disease. Neurology. 2014;82(5):412-418. 5. Scharre DW, Chang SI, Nagaraja HN, et al. Paired studies comparing clinical profiles of Lewy body dementia with Alzheimer's and Parkinson's disease. J Alzheimers Dis. 2016;54(3):995-1004. 6. Folstein MF, Folstein SE, McHugh PR. "Mini-mental state." A practical method for grading the cognitive state of patients for the clinician. J Psychiat Res. 1975;12(3):189-198. 7. Fahn S, Elton RL. UPDRS program members Parkinson's Disease Rating Scale. In: Fahn S, Marsden CD, Goldstein M, Calne DB, eds. Recent Developments in Parkinson's Disease, vol. 2. Florham Park, NJ; Macmillan Healthcare Information; 1987:153-163.